At the Manga Summit Festa 2008, an event organized for general visitors, an area called "Let's draw a future low carbon society" was set up. 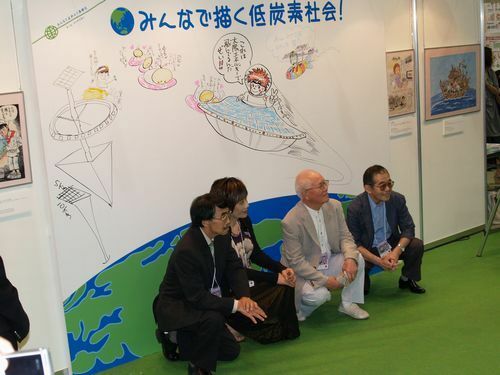 There, popular manga artists delivered messages about global warming prevention by drawing their friendly original characters on a large, 2.5 x 3 meter panel. Machiko Satonaka, a leader of the planning committee　drew cute aliens on the panel and remarked, "Through environmental beautification activities, I hope the earth will become a tourist destination for visitors from outer space." At the symposium on manga and the environment, organized by comic artists working in Japan, Korea, China, Hong Kong, and Taiwan, artists exchanged opinions about the issue. Also, at a panel discussion on manga and food culture, the speakers made presentations on the relationship between food culture and cartoons. One of the opinions expressed in the discussion was that manga artists have a responsibility to offer their readers various information about such topics as food safety and health, through their work.